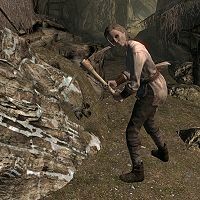 Fruki is a Nord miner who works in the Quicksilver Mine in Dawnstar. She carries her pickaxe, her house key, and a random selection of lower-class items and gold. She wears a set of miner's clothes with boots. Before you have completed the quest Waking Nightmare, Fruki will say, "Lady Mara will save us from these nightmares. You'll see." She will also mention the feud between her boss and his ex-wife Beitild, saying, "Used to be twice as many miners working here before all this trouble started." The only other comment from her will be an anonymous "I work in the mine, just like everyone else." This page was last modified on 4 June 2014, at 21:04.